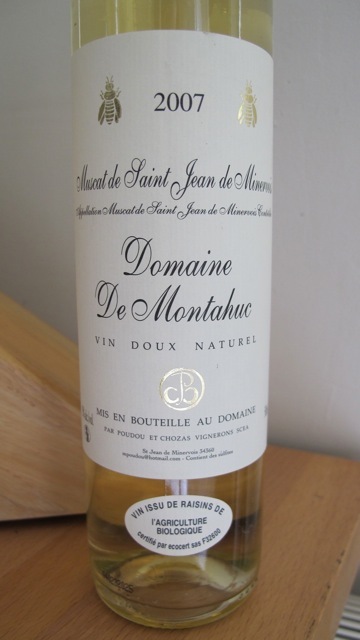 DOMAINE DE MONTAHUC MUSCAT – This organic muscat is from the tiny appellation of St Jean de Minervois (approx 135 inhabitants), situated in the Languedoc Roussillon region. IT’s an amzing environment up there, with the samll bush vines growing out of limestone rocks. But it’s a killer to pick there, crouched over low vines with the sun belting down on the white rock. It’s the idea of drinking the stuff that makes it all worthwhile. We were constantly being not to eat too many of the grapes! Delicious when chilled… the Domaine de Montahuc muscat de petits grains from St Jean de Minervois – my favourite region for muscat. 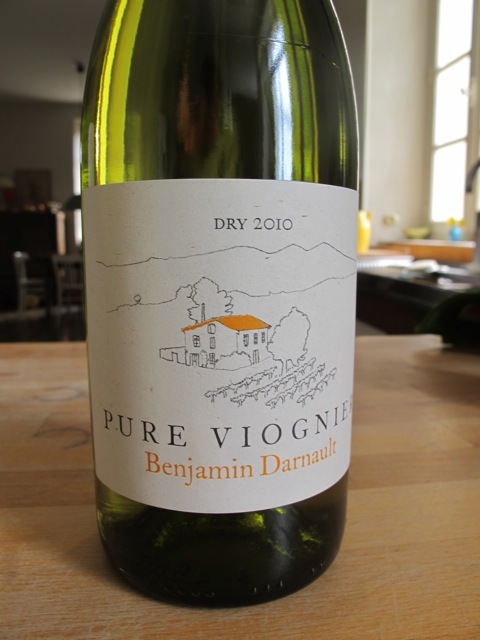 BENJAMIN DARNAULT PURE VIOGNIER 2010 This really is a delicious one. Floral on the nose, giving a delicate sweet nose but actually dry in the mouth. It is a lovely aperitif wine. or matches beautifully with fish and spicy foods, chicken is a good meat with it. 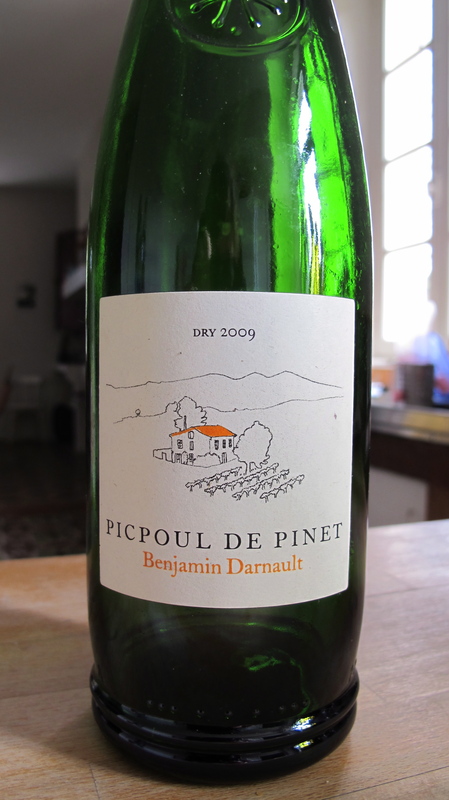 BENJAMIN DARNAULT – PICPOUL DE PINET DRY 2009 A lovely and fresh, zesty white (the variety is actually ‘Picpoul’) that makes a great aperitif wine or matches heavenly with fish and seafood dishes… Clean, vibrant nose and long in the mouth. Hard to stop at just one glass. 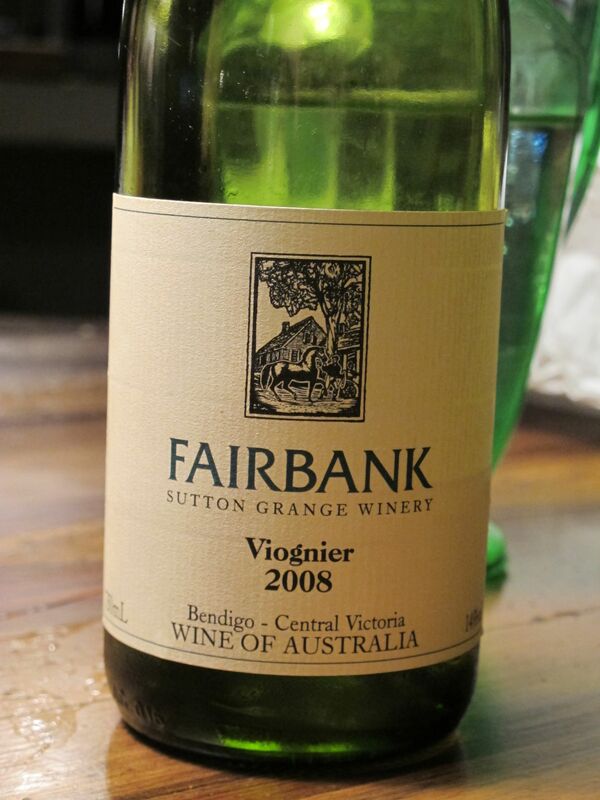 SUTTON GRANGE “FAIRBANK” VIOGNIER 2008 – We opened this one up when we had a dear Aussie friend over for dinner, who hasn’t been back to Australia for some time… It’s made by a friend of ours, Gilles Lapalus, in Victoria – and Gilles, it was delicious! 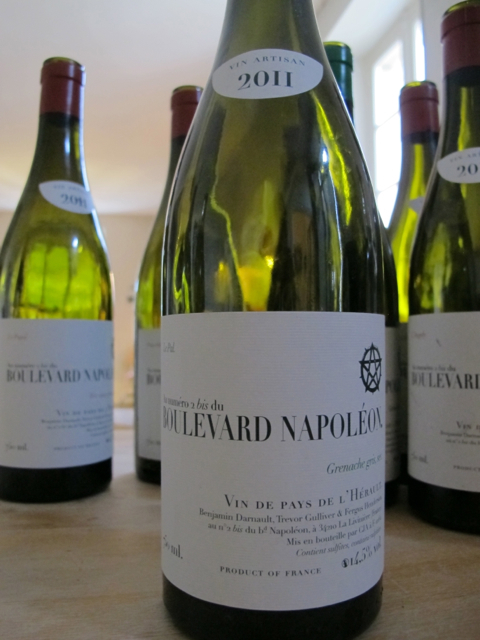 Open, exotic nose, fruity and generous, but still fine and minerally. Very much enjoyed by the girls! merci. 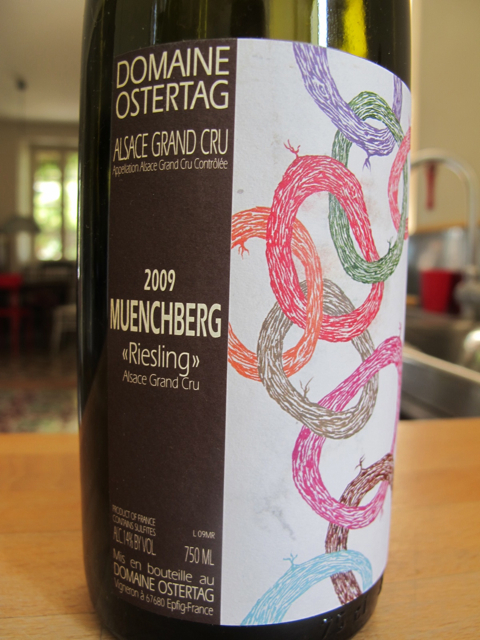 DOMAINE OSTERTAG Muenchberg Riesling 2009 – the first time I tried a wine from this property, was back in 1999. 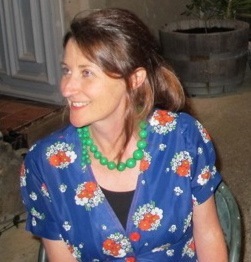 I’d bought a bottle of ‘riesling’ whose lable I’d liked, it was a bit pricier than the others and I felt a bit cheeky buying the wine full-stop (remember I am with a winemaker and so I shouldn’t buy wine – he thinks). We LOVED it, but it was inpossible to find again so the memory stayed with me and the pedestal grew higher and higher! I am very happy to say that we got to drink this winery again (for info they are organic and biodynamic) and it was DELICIOUS!! Hard to describe right now, but simply, an impressive white, minerally, generous and fine. But it still seems young so need to ipen well in advance and drink over a long period/ evening. Easy to say, hard to do.